Americans take BBQ ribs very seriously. When it comes to BBQ ribs, attention to details spans from spice rub/seasonings, sauce, pork flavor, texture, smoke, appearance, scent, mouthfeel, cooking and grilling techniques to the overall balance of the ultimate product. Originated and perfected in the American South, BBQ ribs is at the very core of American food culture. When I contemplated to have a BBQ ribs recipe, I was a little worried. The all-American BBQ ribs is not my everyday Malaysian or Asian recipe, and is surely not my forte. Eventually, I settled with a Chinese-style baby back ribs recipe, using none other the recipe for Chinese BBQ pork or char siu. Sticky sweet with a perfect balance of saltiness plus a touch of Chinese 5-spice powder, char siu sauce marries well with baby back ribs. For the techniques, I used a combination of oven roasting plus BBQ grilling. I set my oven to 325 degrees F and roasted the ribs for about two hours. I then transferred them onto the outdoor grill for a charred finish over direct heat. My verdict: juicy, moist, flavorful, and finger-licking good. Summer is in full swing so surprise your guests with these exotic Chinese-style BBQ baby back ribs! Now, please do tell me what is your favorite BBQ ribs recipe and how you make it. Thank you. Add all ingredients in the marinate/char siu sauce in a sauce pan, heat it up and stir-well until all blended. Transfer out and let cool. Rub the ribs on both sides with the chopped garlic. Marinate the ribs with 2/3 of the marinate sauce for 8 hours or overnight in the refrigerator. Preheat the oven to 325 degrees F. Line a large baking sheet with heavy aluminum foil, lay the ribs on top, and tightly cover with foil. Roast for 2 hours. Preheat the grill and remove the ribs from the oven and uncover. Transfer the ribs to the hot grill and grill over direct heat for 5-10 minutes or until the surface slightly charred to your liking. Brush both sides of the ribs with the remaining char siu sauce plus some oil while grilling. Serve hot. Totally finger, hand, face licking good. We love hoisin on ribs and did a variation of Hoisin glazed ribs with some Sichuan peppercorn rub. Yours look fantastic. Sichuan peppercorn, that’s such a brilliant idea. Why haven’t I thought about it?! That’s the reason why I did it the Asian-style. I would not dare to attempt the all-American recipe. Better stick it to my root and what I feel most comfortable with. They were great. I was totally looking forward to this recipe for the past few days and it does not look to disappoint in any way. I’ve been looking high and low for maltose in the Asian marts around me, but they either don’t carry it or I’m just not looking in the right place. I know. I’ve tried a recipe with honey, but I was definitely missing that sticky finger goodness, and without it it just felt just a TAD bit off. Flavors were nice and all, but it just didn’t ‘feel’ right I guess. I believe they were referring to pineapple/orange juice. Hello! Been reading your site for a looong time. I love ribs, and just found out it helps alot to cook the ribs under foil in the oven for the first hour, then remove the foil for the 2nd hour. The added moisture the foil provides makes for a very very yummy bite! This looks awesome! Saving this recipe right away! 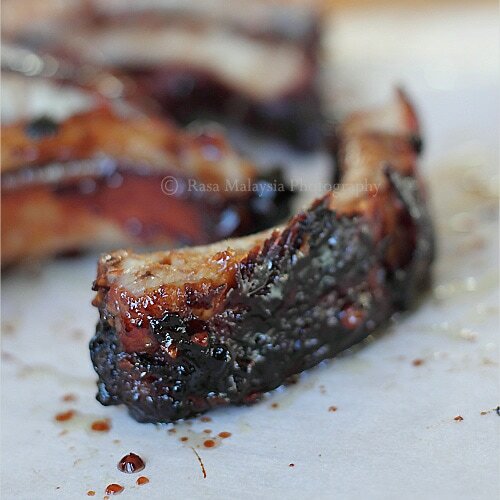 Love sticky savory sweet ribs! :) I can’t find maltose either but will look harder…want that sticky texture! If I don’t have an outdoor grill can I just finish it off on the oven, uncovered and unde the broiler/grill? Yes, you just use oven to broil, uncovered and maybe on high heat for 5 minutes or so until the surface is browned. Remember to check because the settings of the oven might be different. hi bee, this is rachel, i want to say thank you for the inf u email me. i will get in touch of my sis then decide where to go. another nice pic and recipe. can u tell me how to use maltose? very hard like a rock? did u melt the whole container with hot water bath? Maltose is very sticky, so you have to heat it over fire with all the other seasonings to break it down. It breaks down when it’s heated. It’s not like rock, just very sticky. Looks delicious Bee! I love infusing asian flavour into American BBQ’s. It’s surprisingly well received. Thanks. LOL. I am clueless. Too bad, you could have. They are great. I’ve already made this after reading your char siew recipe. I also made another flavor with bulgogi marinade. I’ve announced this year’s Merdeka Open House theme. Do take some time to participate ;-). Forget American style bbq, I love chinese style more! Can’t wait to sink my teeth in these. Sounds like a solid recipe. If you find that you want to render more fat or like them more fall-off-the-boney, definitely give them a splash of fruit juice (apple or pineapple/oj – nice one, matt), seal completely in multiple layers of foil and go at 300 for 3 hours. I like to put an hour of smoke on them at the beginning to ‘set the bark’ (dry the rub, basically) and get that good smoke ring. Glad to see a recipe that doesn’t involve boiling them. I ran across a ‘winning’ recipe on Instructables that advertises fall-apart ribs after a 5 hour boil. I’m pretty sure my shoes would fall apart after a 5 hour boil, too. My husband and I made this last night. When we were prepping the marinade in the morning, I almost died laughing because my husband had such a hard time getting the maltose out of the container. He got it over everything!! And the worst part is that it is extremely hard to clean off. He commented “honey, this recipe had better be worth it because this is insane”. Well, we followed your instructions word for word, and the ribs were AMAZING!!!! My 5 year old ate at least 3 ribs just by herself and when we got down to the very last rib on the plate she stood up on her chair and shouted at the top of her lungs ” Last rib’s mine! I call dibs!” Thanks again for another very very delicious recipe. Since I found your website many months ago, I have been cooking up a storm following your recipes in my kitchen. You have inspired me. All the recipes I have tried are so delicious. I am very very grateful that you share your recipes. Keep them coming. Tried making these ribs and they are fabulous. So tender, juicy and loaded with flavor. Best ribs recipe I have tried! THANK YOU! HV – thanks again for your sweet note. Glad you love my BBQ ribs recipe. Great looking ribs! I wonder if the same recipe can be used on lamb ribs..? Any idea? Going to try this tomorrow…so will be marinating the ribs tonight. Btw, I bought spare ribs coz the butcher didn’t have baby back ribs but anyway spare ribs has more meat and fat than baby back ribs so i’m thinking they might be more tender. Since i bought 1600g of spare ribs will the cooking time still be about the same’ around 2 to 2 1/2 hours? What do u reckon? And do u think its advisable to flip the ribs halfway? Btw, my oven broiler isn’t working…do u think i can crank up the oven to about 250 degrees celsius in the last 10-15 mins or so to still get that nice charred effect? Hope u can reply asap..can’t wait to make these delicious ribs! P.S. i made the char siu recipe with the same marinade and it tasted awesome so was thinking of using it on ribs instead. You might want to cook it longer with the larger amount of ribs. 3-4 hours. For char, you have to use the broiler function. thanks, they came out really finger-licking good. I am making this the day after tomorrow for a dinner party. I am doing it with 2kg pork ribs but these are the fatty ones. I find baby back ribs a bit lean and very little flesh. Should i roast them for 3 hours (possibly 4) and broil for 15 minutes? How long do u reckon i should roast them for? Thanks if u can reply asap. You can roast for 3 hours. Ok, the ribs are marinating now. I only bought about 1.5kg pork spare ribs which are a bit meatier. So should I still roast it total time 3 hours? Maybe 2 hrs under foil, then remove the foil for the last hour? I thought that the last hr without the foil might help to brown the ribs a bit. And then finally 10-15 mins under the broiler? Sorry for sounding so repetitive…a bit worried the ribs won’t turn out perfect tomorrow. Eagerly waiting to try the ribs! You can try, I think it should be fine. The ribs came out perfect! The meat was tender and the outside was caramelized and crisp. My dish for the potluck dinner party was definitely one of the highlights. Everyone loved and raved about it. I actually roasted it for 1 1/2 hrs under the foil then removed the foil and roasted for another hour (as suggested by one of the readers) then finally broiled for about 5 mins per side. I also used some of the leftover marinade with the pan drippings and reduced it down to a sauce to drizzle on the ribs. Thanks a lot….i’m sure the pork belly with this marinade will turn out stunning. Ooops, sorry no i didn’t mention that. Next time they ask i will tell them. But anyways thanks for the tips…i’ve tried numerous of ur recipes and they’ve turned out really well like ur char siew, honey walnut shrimp, soy sauce chicken and yong tau foo sauce (although i added some hoisin sauce and it really tasted A LOT better). Hi there, i’ve just stumbled onto your website as i’m looking for some recipes to cook for my partner who is going to return home tomorrow. usually i refer to kuali.com. just wondering… what’s maltose? The recipes looks great, but if I can not find Rose wine, what would be an appropriate substitute? The maltose was easry, for now, and the rest I stock, in my pantry. The Rose wine, that is the quandry. Can you help me? Thanks, Rasa Malaysia, but I found the Rose wine. I am going to do a marinate a slab of ribs tonight. For those in the Tampa St Pete area, the Oceanic Oriental Supermarket carries the Rose wine. The ribs turned out great! I now need a way to give them some fire. Perhaps some sweet chili sauce from Thailand instead of honey. I made it today for dinner, it was very delicious. Been planning to make these for a week, had them marinating for days and end up having to take my partner to the hospital just before I start cooking. Hope they turn out good cos my missus is in a foul mood! No pressure or anything. Hi, can I make this without grilling? I’ve been wanting to try to make your bbq pork recipe but am lacking of maltose. I have no idea what that is, but can i substitute it with corn syrup? Is that the same thing? is there another substitute for Chinese Rose Wine, I am looking forward to makeing this for my superbowl party in two weeks on Feb 3rd. What wine could I use as a substitute to the Chinese rose wine and the maltose? My whole family loves ribs. I am going to surprise them with the Chinese style rib recipe. I am sure they will love it. where can i get baby back ribs around klang valley? checked cold storage and they don’t understand baby back ribs and show me spare ribs instead..
beer is made with malt. you can purchase liquid malt at a wine and beer supply place. if it’s not sweet enough, which it should be, add a little honey or molasses. “maltose” when you cook you need to be flexible. add whatever your taste buds dictate. I also add a little liquid smoke to mine. Just found out about your recipes and while perusing meat and seafood options happened upon the BBQ RIBS. Sounds heavenly and trying them this evening. As a dyed in the wool bbq person I simply cannot thank you enough for what you’re giving to the food community. Most of your recipes will grace my table. Thanks again. Hi Makis thanks for trying my BBQ ribs. Yes all my recipes taste amazing.